Provide your contact information below or call us at 281-487-1501. Moody Health Center is the teaching clinic and public clinic of Texas Chiropractic College. 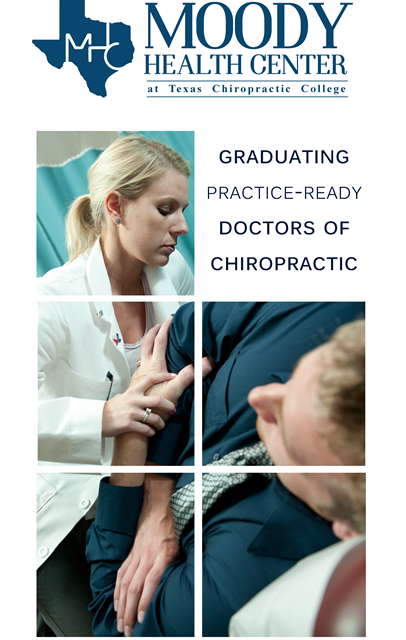 Texas Chiropractic College is the third oldest chiropractic college in the world, founded in 1908, and Moody Health Center has been in its current location serving the Pasadena and surrounding communities for the past 50 years. We are a multidisciplinary clinic facility with chiropractic and medical services. Our 18,000 square foot clinic houses a rehabilitation facility, an urgent care center open 7 days per week, and one of the largest chiropractic clinics in the country. We have five staff chiropractic doctors who provide professional services with a variety of specialty interests, such as sports injuries, occupational injuries, acupuncture, and family chiropractic care. Please call or visit us for your chiropractic and healthcare needs.